In 2019, the Victorian Government announced further support measures to assist farmers and communities to prepare and respond to drought and dry seasonal conditions in Central and East Gippsland and Northern and North West Victoria. Stanhope and Congupna on the 22nd. 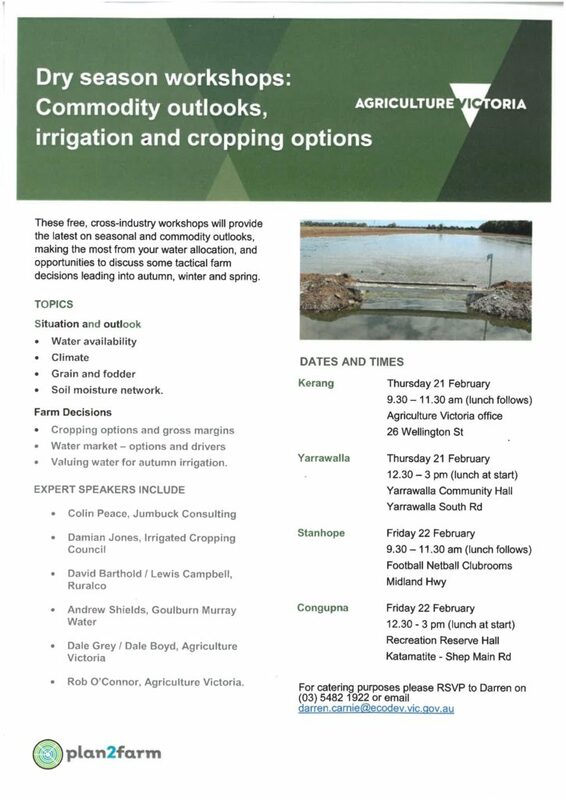 Workshop sessions will include Commodity outlooks, irrigation and cropping options and a range of speakers talking to water management, climate, soil etc. Locations – Kerang, Yarrawalla, Stanhope and Congupna. See the below flyer for more details and RSVP information. I write to introduce myself; my name is Danny Pettingill, and as of last week I have taken on the LPLN Landcare Facilitator and GOANNA Project roles from James Nelsson. I would like to thank James for his service and dedication in the role and wish him all the best with his new position as he moves on to new and exciting challenges. His passion for the role and the work of the LPLN Landcare and Friends groups is clearly evident. As for me, I come from a background in engineering, theatre design and education and have since retrained in natural resource management and environment. As a proud ‘generalist’ in the environmental field, my interests are broad and my curiosity draws me to many things. I do however have specific interests in native and indigenous pollinators such as bees, wasps, bats and avian species (I’m a beekeeper in my spare time), natural regenerative farming techniques and indigenous fire management practices, I’m also an avid ‘birdo’. Outside of the environment industry, I’m a footy tragic, love my Bowls on a Saturday and wild about things on two wheels. James and I have spent some time going through a handover (some of which I am still getting my head around!) and I wanted to take this opportunity to touch base with you all as the LPLN moves forward. It appears there is much to get up to speed with and many people to meet across a wide range of collaborative projects. If there are things of an urgent nature to start talking through please don’t hesitate to get in touch (all details are the same and provided below) so we can ensure everyone is on the same page with the same expectations. Though the next few weeks will be a little intense getting my head into all the groups and projects that the network is involved in, I’m really happy to discuss network projects with you all in order to move forward – the best way for me to get a handle on things! I am incredibly excited about taking on this role and I look forward to working with you all on existing and future projects. The Department of Environment, Land, Water and Planning (DELWP) is delivering a small grants program to build resilience to climate change impacts through community-driven adaptation activities that address identified gaps and priorities in Victoria’s regions. In total, the available funding for the 3CA Grants program is $1,000,000. Grants between $25,000 to $75,000 will be awarded. Projects must be completed no later than 31st December 2020. The 3CA Grants program provides funding for local communities to adapt to climate change impacts in their region of Victoria. Eligible projects must either be led by, or implemented in partnership with, a local council, traditional owner corporation, community group, or not-for-profit organisation. What type of projects might be funded? These projects will aim to build the capacity of communities or regions to better plan for, coordinate and deliver actions that support communities to adapt to current or future climate change impacts. Delivering Adaptation Action projects will implement practical actions that will support communities and regions to adapt to current or future climate change impacts. This role offers the successful applicant the opportunity to work with the NCCMA, Dja Dja Wurrung, Barrapa Barrapa, Loddon Shire, school groups, TAFE and University students, local communities and volunteers. Across the Network, there are a number of interesting monitoring activities, protection of threatened species and exciting sustainable agricultural activities that you will be involved in, all with the support and guidance of a very committed Committee of Management. Although this can be a very busy position, it gives the occupant a wide variety of interesting and sometimes challenging NRM and community engagement opportunities. Over the past three years, I have been involved in (or managed) many kilometres of direct seeding, hundreds of hectares of revegetation, and protecting of natural resources. This role offers the successful applicant the opportunity to work with the NCCMA, Dja Dja Wurrung, Barrapa Barrapa, Parks Vic, DELWP, Loddon Shire, school groups, TAFE and University students and local communities. 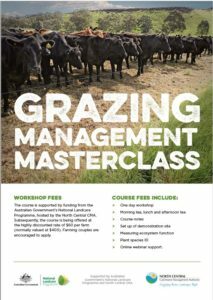 There are a number of interesting monitoring activities, protection of threatened species and exciting sustainable agricultural activities that you will be involved in, all with the support and guidance of a very committed Committee of Management. Please click on the attached link to the role (if link doesn’t work, please copy and paste it into the address bar of your browser), and feel free to share amongst people that you think may be interested in this exciting role. After nearly three years in the role, it is with a mixture of excitement and sadness that I have tendered my resignation to the LPLN Committee of Management, with my last day being the 1st of February 2019. I would like to extend my personal thanks to the Committee of Management, especially Michael Moore (Secretary, with whom I have worked very closely), Andy Hay (president for most of my time), Jean McClymont (the previous and long term Treasurer) and Kate Lee (Treasurer) for their active support in my tenure, and to the rest of the Committee of Management for their ongoing vision, commitment and encouragement. 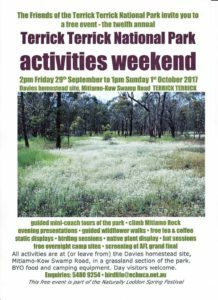 I have really enjoyed this role and appreciated the opportunity that the Loddon Plains Landcare Network has provided me. I have been made to feel very welcome by the various Landcare groups across our Network, and in the process, I made some wonderful friendships. I also believe that I have made a valuable contribution to this role and our local environment. 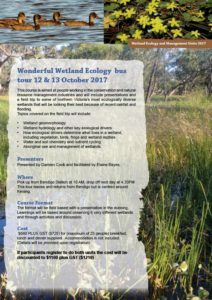 I wish you all in this vibrant Landcare community well in the future, and I hope that our politicians realise what an important role that you, the volunteers, carry out, including the dedication and passion in which you undertake it, with no financial recompense and often little or no recognition. I hope that our Governments will more greatly appreciate the importance of the environment and agriculture, and how intertwined they are, especially as the impacts of Climate Change are more strongly felt. I hope that our Governments will increase the resources to Landcare and fund us more appropriately, based on the great challenges that now face us all. Thank you all for welcoming me into this role, for supporting the Landcare activities we have been involved in, and especially for the great work that you have done. 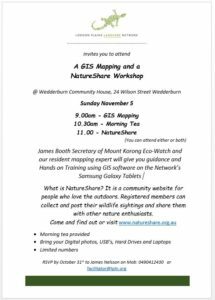 There will be two FREE workshops on Sunday 5th of November at the Wedderburn Community House. The 9:00 am workshop is on how to use the simple mapping program, Avenza (which is free to download and use on Android phones or tablets). We will have plenty of Samsung Tablets to use (or you can bring your own device if you wish). This is a great way to map out sightings, areas of weed, accurately map out paddocks, record walking tracks etc. The 11:00 am workshop is on how to use the NatureShare website www.natureshare.org.au. This is a great site, where you can share images of our local biodiversity and view what else has been sighted in our local area. Hope to see you there, but don’t forget to RSVP to facilitator@lpln.org. 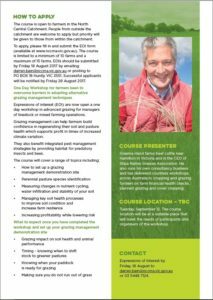 Expression of interests are now being taken, the workshop will be held on September 12, 2017 with Graeme Hand presenting on the day. To register please complete the expression of interest and return to Darren by post or email by August 18, 2017. This is a great weekend and you get to visit the endangered Plains Wanderer habitat, hear great speakers and generally have a great time. I suspect that this may be of interest to a few of you. 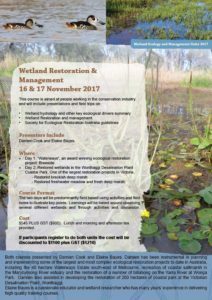 The Wetland Ecology and Management course is back. 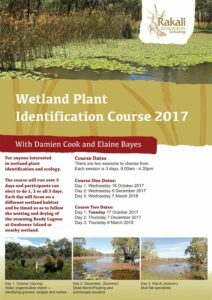 This year Rakali Ecological Consulting are running three wetland courses (you can see details below or on their website).